Evaluation: Athletic forward that brings a high level of toughness to the court. Harris is still raw as a basketball player but his 6’6 frame with length and leaping ability make him an excellent rebounder on both ends of the court. Wide shoulders that should fill out more as he grows and quick feet add to his athleticism as he can run the floor and push bodies around inside. Harris shows a nice shooting stroke from the foul line and is comfortable facing the basket on the wing. With work he could quickly become one of Ohio’s top 2014 players. Bottom Line: Harris is a great athlete with a hardworking attitude that has a high ceiling potential wise as he continues to improve on his ball skills. 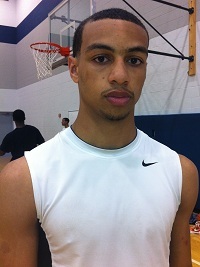 With development Harris has a good chance to be a very good college player at the Division I or II level.